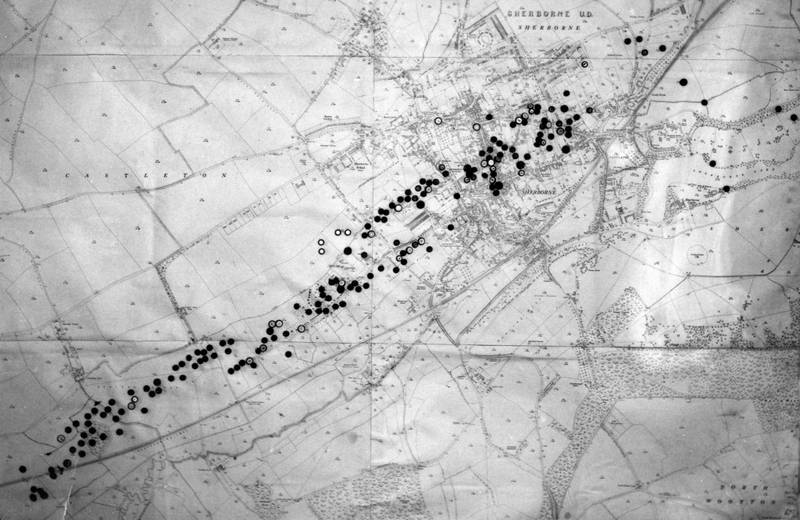 At 4.40pm on Monday, 30 September 1940, Sherborne was heavily raided by a force of some 150 German bombers which, having been turned away from Yeovil by fighters, dropped several hundred bombs (about 60 tons) in a straight line from Lenthay to Crackmore. About 86 buildings were destroyed, including ten houses in Lenthay and Foster’s Infant School in Newland, amazingly though neither the Abbey nor Sherborne School were hit. Seventeen civilians, including six children, died as a result of the bombings and thirty-one casualties were taken to hospital, one of whom died from his wounds six years later. For several weeks, due to an unexploded bomb in the road at the junction of Half Moon Street and South Street, all east-west traffic had to go through the School courts. Six bombs landed on the School playing fields and the Upper was out of action for the rest of the season. Six more bombs fell in the School precincts and although no School building received a direct hit, roof tiles were blown off and windows destroyed, including the West window in the School chapel. By a strange coincidence, it was an Old Shirburnian, Squadron Leader Peter Devitt, who led the eight RAF Spitfires that intercepted the Heinkel He.111 bombers over Sherborne that day.